Mickey Rooney, Hanno Schilf, Mariapfarrer church choir, Oberndorfer Liedertafel (singers), Wiener Sängerknaben (Vienna Boys Choir) and Lionel Richie. Lyrics with verses 4 and 5! First english historic correct translation in the spirit and meaning of Joseph Mohr including all 6 verses. On this tape, Oscar prizewinner Mickey Rooney narrates the book about the story behind this carol. The founder of the silent night museum in Salzburg about the new level of knowledge about origin and historical background of this world famous christmas carol. The museum is at the historical birthplace of Joseph Mohr, creator of the carol 'Silent night! Holy night!'. It's also a center of historic resarch about the carols origin. 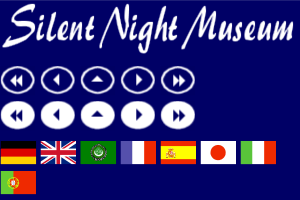 Salzburg museums: Silent Night! Holy Night! The birthplace, up to now a storage room, is dedicated to Joseph Mohr, who wrote the song in Mariapfarr in 1816. He is no longer mentioned in most church song books in the world. The creator of 'Silent Night! Holy Night' was born on December 11. 1792 in Salzburg, in the Steingasse. The young priest wrote the carol in 1816 in Mariapfarr. This book covers the story of this famous christmas carol according to evidence from a document discovered in 1995. From the first 'Silent night' movie from the year 1933 up to the last recent documentation about the creation of the carol. Hanno Schilf resarched the true story of the world famouse christmas carol. He founded the silent night museum in Salzburg to make the results of his resarch world wide known.